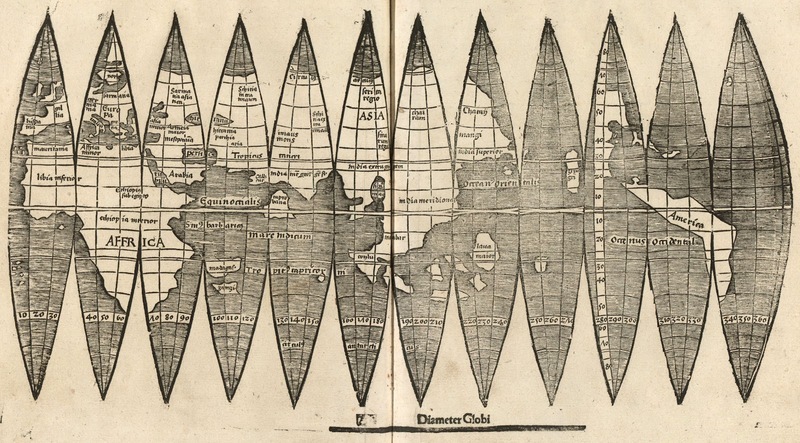 Waldseemüller’s world map globe gore (1507) showing an ocean between Asia and America. Martin Waldseemüller’s 1507 World Map is the first map to use the name ‘America’. One copy has survived, it is on display at the Library of Congress. 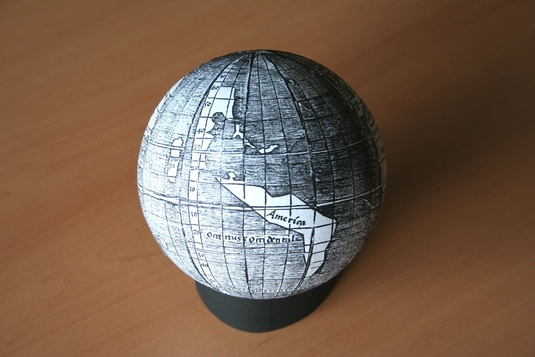 He also published a set of globe gores: printed maps designed to be cut out and pasted onto spheres to form globes. Based on account by Columbus and Vespucci the German cartographer Waldseemüller may have reached the conclusion that the newly discovered lands had to form a distinct continent instead of the eastern coast of Asia. So in 1507 he draw an ocean between the new continent and Asia, the first actual accounts by explores to set eyes on this ocean date from 1512-1513. When neatly cut and pasted it forms a globe of about 4.5 inches in diameter. The gores, also containing the inscription America, are believed to have been printed in 1507. Five copies of the gores are still existing; a.o. the The James Ford Bell Library in Minnesota and the University and State Library of Munich posses a gore. That's a very small America! Never knew the word ("gores") before; very interesting post, Rob! Already after few years people had very clear ideas about the new situation!